Anthurium brevispadix Croat, sp. nov. TYPE: Panama. Code: along road above El Copé on Continental Divide, 5.2 mi. N of El Copé, 900-950 m, 1.5 mi. N of sawmill, 8°39'N, 80°36'30"W, Croat 44546 (MO 2806658, holotype; K, PMA, US, VEN, isotypes; Live at MO). Planta epiphytica; caudex ca. 10 cm longus; cataphyllum persistens fibris tenuibus; petiolus teres, 4.5-8.5 cm longus; lamina subcoriacea, linearis, basi acuta ad obtusa, (6-)11-20 cm longa, (1.5-)2-2.8 cm lata, utrinque glanduloso-punctata; inflorescentia erecta; pedunculus 10-13.5 cm longus, teres; spatha membranacca, pallide viridis, anguste ovata, 1.4-2 cm longa; spadix pallide viridis; 1.6-2.5 cm longus; baccae ignotae. 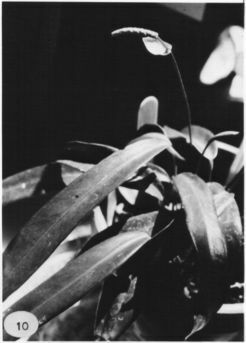 Epiphyte; stems ca. 10 cm long, 7 mm diam. ; leaf scars covered by persistent cataphylls; roots pale green, 2.5-3 mm diam. ; cataphylls moderately thin, 2.3-2.7 cm long, acuminate at apex with a subapical apiculum 3 mm long, drying tan (B & K. Yellow 6/7.5), weathering to fine persistent fibers. LEAVES with petioles erect-spreading, terete, 4.5-8.5 cm long, ca. 1.5 mm diam. ; geniculum 7-12 mm long, weakly sulcate; blades subcoriaceous, linear, gradually acuminate at apex (the acumen flat), acute to obtuse at base, (6-) 11-20 cm long, (1.5-)2-2.8 cm wide, broadest near middle, the margins markedly revolute; both surfaces semiglossy and glandular-punctate, the glands sparse and more or less obscure on upper surface, the epidermis weakly papillate; lower surface slightly paler with the glands dense and reddish brown; midrib weakly raised at base above, flat midway, weakly sunken near apex; weakly raised below, broader at base, narrow and acute toward apex; primary lateral veins 5-7 per side, departing midrib at 30-35° angle, obscure above, flat, darker than surface below; interprimary veins scarcely visible below; collective vein arising from the base, not apparent above, slightly darker than surface below, 1-3 mm from margin. INFLORESCENCE erect, shorter than leaves; peduncle 10-13.5 cm long, ca. 2 mm diam., terete, 2-3 times longer than petioles; spathe thin, pale green, narrowly ovate, 1.4-2 cm long; spadix pale green (B & K Yellow-green 6/10), only slightly tapered, rounded at apex, 1.6-2.5 cm long, 3-3.5 mm diam. midway; flowers rhombic, 2.2-2.4 mm long, 1.8-2 mm wide, the sides straight to sigmoid, 3-4 flowers visible in the principal spiral, 6-7 flowers visible in the alternate spiral; tepals matte, minutely papillate; lateral tepals 1.1-1.3 mm wide, the inner margin broadly rounded to more or less straight; pistil slightly raised, green; stigma oblong-elliptic, ca. 0.3 mm long, weakly exserted, brush-like; stamens emerging in a prompt complete sequence from the base, leading spiral preceding the completed flowers by ca. 6 spirals, the first lateral to two-thirds the length of the spadix (preceding second lateral by 3 spirals) while the completed spirals are present in the lower one-fourth of the spadix; anthers white, ca. 0.2 mm long, 0.4 mm wide; thecae ovate, slightly divaricate; pollen white. INFRUCTESCENCE not seen. Fig. 10. Anthurium brevispadix is endemic to Panama in Code Province near El Copé at 900 to 950 m in premontane rain forest, and it is known only from two collections. The species, a member of section Porphyrochitonium, has leaves nearly identical to those of Anthurium friedrichsthalii, but they are much smaller, usually less than half as long. Anthurium brevispadix differs in having a radically different inflorescence with a long stipitate (stipe one-sixth to more than one-half as long as spadix at anthesis) yellowish green spadix with only three to four flowers visible from any angle in its principal spiral and with stamens that remain exserted after anthesis. In contrast, A. friedrichsthalii has a consistently sessile, generally much longer spadix (when fully developed) that has at least five flowers visible per spiral from any angle and stamens | that are consistently retracted from view beneath |lfae tepals after being briefly exposed. Anthurium brevispadix (so named because of its short spadix) may be confused with A. redolens, which also has a similarly shaped leaf with the collective veins more prominently sunken than the primary lateral veins. That species differs in having a spadix that is pale lavender or creamy white becoming lavender soon after anthesis and later purplish (see that species for additional comments). Anthurium curvilaminum also has a collective vein more prominent than the primary lateral veins, but it has a much thicker blade and also has a purplish spadix. CoclŽ N of El Copé, Croat 44546 (K, MO, PMA, US, VEN), Maas et al. 2763 (U).